Chipotle announced it will launch a loyalty program to retain customers and get back those it lost after a series of food scares in 2015, and again last year, damaged its reputation. Pictured is the Chipotle at 15th and Walnut Streets in Center City. Chipotle Mexican Grill is trying to save its lunch. Once the darling of Wall Street, the fast-casual restaurant chain known for supersized burritos is crawling back from a series of food scares involving E. coli and norovirus in 2015, and again last year, that cratered the company's stock price, hurt its reputation, and left customers reeling. How bad was the hit? 2016 comparable sales fell 20.4 percent from the previous year, while Chipotle's share price was sliced by more than half in three years. The stock traded at $674.89 per share in mid-February 2015 (pre-food scares), and closed at $286.65 on Thursday, down $3.26. In the last week, Chipotle named a new chief executive officer from Taco Bell, and earlier this month announced it will soon launch a loyalty program, which will let customers earn free meals based on frequency of visits. There's a focus on customer enhancements, such as a better menu and online ordering. "Chipotle represents a unique [recovery] situation because the food safety incidents call into question the 'Food With Integrity' mantra that its brand was built upon," wrote Morningstar analyst R.J. Hottovy in an October 2017 report. "We believe Chipotle faces a long road in rebuilding consumer trust." Chipotle announced earlier this month that it will launch a loyalty program to retain customers and get back those it lost after a series of food scares and negative publicity damaged the brand’s reputation. Pictured is the Chipotle in Baltimore’s Inner Harbor. Chipotle boasts of using healthier and fresher ingredients than its fast casual rivals, such as McDonald's, but got clobbered with a food safety crisis of its own with multiple outbreaks of E. coli, salmonella and norovirus starting in 2015 that sickened hundreds of customers across about a dozen states, including Pennsylvania. It temporarily closed restaurants and implemented strict health protocols to fix the problem. The company spent all of 2016 working on its issues, but suffered a setback last summer when the food safety concerns resurfaced. Last July, a sick Chipotle employee caused a norovirus outbreak at a Sterling, Va., Chipotle. Multiple customers who ate there complained of nausea, vomiting and diarrhea, symptoms consistent with the highly contagious norovirus it dealt with two years earlier. That same month, mice were discovered in a Dallas Chipotle. Given the firm's recent history, "we believe it prudent at this time to take a more cautious outlook about Chipotle's same-store sales and earnings trends," wrote Nomura-Instinet restaurant analyst Mark Kalinowski, who lowered his price target for Chipotle shares by 20 percent, from $480 to $385, after the last norovirus incident. The brand that turns a quarter-century old this year has been in perpetual rebuilding mode since. Chipotle's reputation score slid from 74.1 in 2015 to 55.7 percent in 2016, to 63.1 last year, according to the Reputation Institute in Cambridge, Mass., which tracks more than 7,000 companies annually. "While progress has come more slowly than we would like, it's definitely not all doom and gloom," Chipotle spokesman Chris Arnold said this week "We are making progress. Over the last year or so, we have put in place a number of food safety enhancements on the heels of the issues we saw in 2015 to put us on a path to meet the goal we set to be industry leaders in food safety." Arnold pointed out that Chipotle's 2017 revenue rose by nearly 15 percent over the previous year, and same store sales grew at a rate of 6.4 percent for the year. It has also helped to improve customer sentiment as measured by its internal brand health tracking study, and a recent survey from YouGov. Arnold also cited changes to the board of directors. Two new officers were added and four new directors replaced the four who resigned, in addition to the CEO who was just hired. Effective March 5, Brian Niccol will become the new CEO to replace M. Steven Ells — who is also founder and chairman of Chipotle. Niccol most recently served as CEO of Yum! Brands' Taco Bell Division, where he helped lead the highly successful turnaround of that business. During the company's fourth-quarter 2017 earnings call on Feb. 8, outgoing CEO Ells put the chain's beginnings in perspective. "When I started Chipotle, I wanted to show that just because food is served fast doesn't mean it has to be a typical fast-food experience," said Ells, now executive chairman. "It wasn't a commonly held view at the time, but it certainly has paid off. I continue to believe that this approach to serving nutritious, wholesome and delicious food remains highly valued by our guests and can deliver strong returns to our shareholders." Lashawn Holmes, 26, of Baltimore, goes to Chipotle about a dozen times a month. She said she stuck it out with the brand despite all the bad publicity. "It happens," said the restaurant server as she dug into her $8.46 steak bowl at a Chipotle near Baltimore's Inner Harbor last weekend. "They're making adjustments and moving on. It's no reason to stay away from their food because it's really very good." Lashawn Holmes, 26, of Baltimore, said she has stayed a loyal Chipotle customer despite the restaurant chain’s recent problems. Analyst Hottovy said in his October report that Chipotle had several strategic advantages, including a simple but uniquely customizable menu and pleasing restaurant designs. "Even with its current struggles, we forecast Chipotle will generate $4.5 billion in sales during 2017, making the company still one of the largest players in the $10 billion-plus fast-casual Mexican category and $44 billion domestic fast-casual category and an important partner for suppliers." There were 2,408 Chipotle restaurants nationally at the close of 2017. The company expects to build and open 130 to 140 more this year. Arnold said most will be in proven markets, such as Pennsylvania, where stores will open in Hummels Wharf, Media, Blue Bell, and Philadelphia. There are 22 Chipotle's in the region, including several in South Jersey. 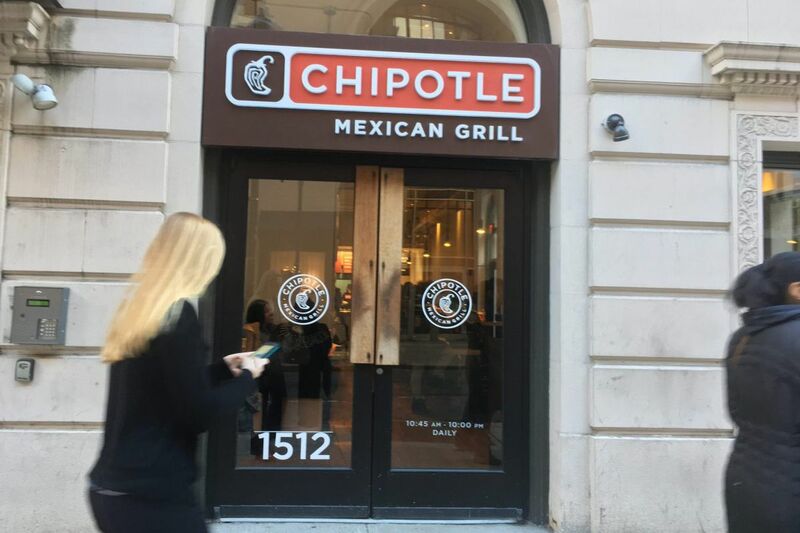 "Landlords love Chipotle," said Jacob Cooper, managing director at MSC Retail, which represented landlords in deals to bring Chipotle to University City and Center City. "They have corporate credit, pay market rents, and have a brand with longevity that has survived its share of public relations issues." Chipotle's new loyalty program will allow Chipotle to differentiate itself from the competition, said Tom Caporaso, CEO of Clarus Commerce, a marketing/technology platform for loyalty programs. Chiptopia, a temporary program, was discontinued in 2016 after a summer trial run. Chipotle spokesman Arnold said more details of the new one will come when it starts the second half of 2018. "If their last loyalty program, Chiptopia, is any indication of things to come, then Chipotle's benefits mix will offer customers more than their fast-casual peers," Caporaso said. "Their competitors offer much more traditional transaction-based rewards programs, but Chipotle went beyond just points and offered experiences like free catering. Their rewards were based on visit frequency rather than transaction amounts, so customers didn't need to spend the amount of money they would at other fast-casual chains to enjoy the benefits." Larry Gelfand, 52, of Penn Valley, said he was in "as long as the program is mobile-first and only, and I don't have to carry a little card around or a password. Just connect it with whatever my cellphone is." "It's still a premium brand," said Gelfand, as he finished off a burrito at the Chipotle at 1512 Walnut St., one of three in Center City. "It's very relevant for the health-conscious foodies who must satisfy their burrito fix."